A top aide to Venezuelan opposition leader Juan Guaidó is being charged with terrorism after he was arrested by President Nicolas Maduro's government. Mr Guaidó's chief of staff Roberto Marrero, 49, is accused of planning "acts of sabotage" against officials. 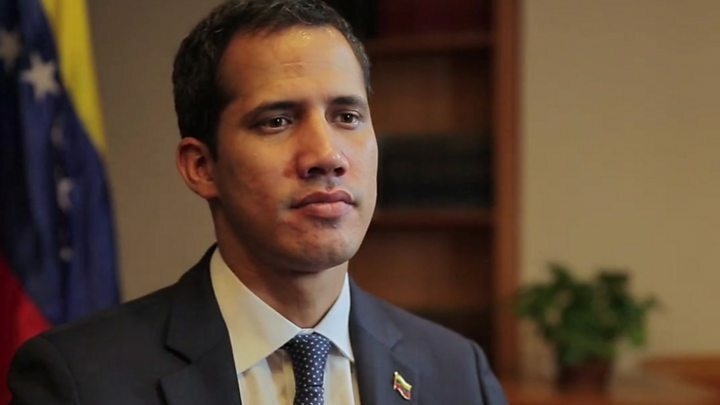 Mr Guaidó has called for Mr Marrero's immediate release. He said that the security forces had committed an "illegal and unconstitutional" act, adding that he believed the items allegedly found at Mr Marrero's home had been planted there. 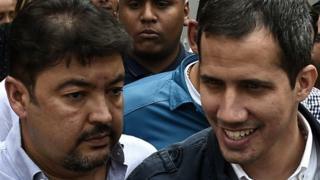 Mr Guaidó has described his aide's detention as a "vile, vulgar kidnapping". Mr Marrero was arrested as part of an operation to dismantle a "terrorist cell" allegedly planning attacks on the government, Mr Reverol said. His bodyguard, Luis Paez, faces similar charges. At a press conference on Thursday, he said Mr Marrero's arrest "won't make us deviate from the path we are on" and asked Venezuelans to "stay united and mobilised". He is Mr Guaidó's main political adviser and his detention is likely to raise tensions both within Venezuela and internationally, the BBC's Will Grant in Caracas reports. How has the US reacted? US Secretary of State Mike Pompeo and National Security Advisor John Bolton were among those to denounce Mr Marrero's pre-dawn arrest at his Caracas home. On Thursday, Mr Bolton tweeted: "Maduro has made another big mistake. The illegitimate arrest of Roberto Marrero, Interim President Juan Guaidó's aide, will not go unanswered. He should be released immediately and his safety guaranteed." President Trump this week said "all options" are being considered in relation to the situation in Venezuela, alluding to the possibility of military action. On Friday, the US imposed sanctions on the Venezuelan economic development bank Bandes. US Treasury Secretary Steven Mnuchin said Mr Maduro and his enablers had distorted the original purpose of the bank in a desperate attempt to hold onto power. "The regime's continued use of kidnapping, torture, and murder of Venezuelan citizens will not be tolerated by the US or the international coalition that is united behind President Guaido," he said, before calling for Mr Marrero's immediate release.